Join the Conservatory of Music for an evening of Jazz with guest artist Pamela York, piano! The concert will open with Pacific Little Big Band, directed by Jamie Dubberly. 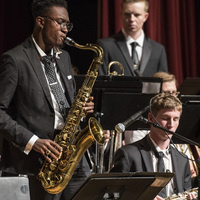 Following PLBB, we will feature Pacific Jazz Ensemble directed by Patrick Langham. Pamela York is a Canadian jazz pianist and an accomplished performer, composer, and recording artist. In 2007, she won the Great American Jazz Piano Competition. Her 2012 release, Lay Down This World: Hymns and Spirituals, was a 2013 Downbeat Magazine editor’s pick. She tours nationally as a performer, clinician, and guest artist. Among her performances with dozens of jazz greats, Pamela has shared the stage with Conte Candoli, Joe LaBarbera, John Clayton, Jeff Hamilton, Lynn Seaton, Roseanna Vitro, Diane Schuur, and Andre Hayward. Based in Houston since 2001, Pamela plays regularly with the Houston Jazz Orchestra and leads her own trio. Tickets available at the door or at go.pacific.edu/musictickets.